Revealed at CES 2014 in January and rumored for weeks before then, the Asus VivoTab Note 8 has finally gone on sale. 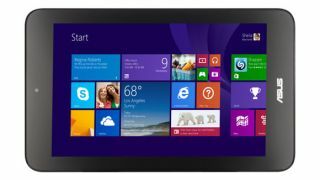 Microsoft itself put the Windows 8.1 tablet up on its Microsoft Store website, though it's only available in one storage option, and for slightly more than was previously announced. On Monday customers could briefly order the 32GB Asus VivoTab Note 8 for $329 (about AU$367), though at the time of writing the tablet is listed as out of stock. Regardless, that's just over the $299 (AU$334) price point that was announced at CES, and the 64GB version of the VivoTab Note 8 is still nowhere to be found. The Asus VivoTab note 8 is a rather budget-friendly tablet with the latest version of Windows and an 8-inch 800 x 1280 screen. It packs an Intel Atom Z3740 Bay Trail processor, 2GB of RAM, 8 hours of battery life, microSD expansion, and 5- and 1.2-megapixel cameras. It also comes with a Wacom digital stylus. The Asus VivoTab Note 8 first leaked in December, when we examined its specs and speculated about its price. After the user manual leaked online, it was only a matter of time before Asus announced it at CES.